At a networking event, there will be tons of people. Upon entering it may be tough to differentiate between who you’ve talked to and who you’ve haven’t. When you network, you want to be memorable. Trying to stand out to potential clients and employers is tough enough but especially when you’re in a sea of black and navy blue attire. However, nothing says “Remember me!” like a bubble gum pink sports jacket. I’ll be honest, when I wear my pink jacket, I think I look great! And because of that, my confidence skyrockets. Where I’m usually shy or more reserved, I’m able to come out of my shell and speak up. I’m not afraid to start conversations or break the ice. When you’re networking, you definitely don’t want to be a wallflower. You want to get out there and market yourself/company and you can’t do that if you’re too shy to talk to anyone! You should always wear what you like. When you wear something you like, you’re going to be more comfortable than if you wore something you didn’t. With my jacket, I’m dressed for success without having to give up my personal style! It’s very important to not lose your true sense of self when shopping for more professional clothing. Next time you find yourself shopping for professional attire ask yourself: “Am I confident in this? Am I comfortable? 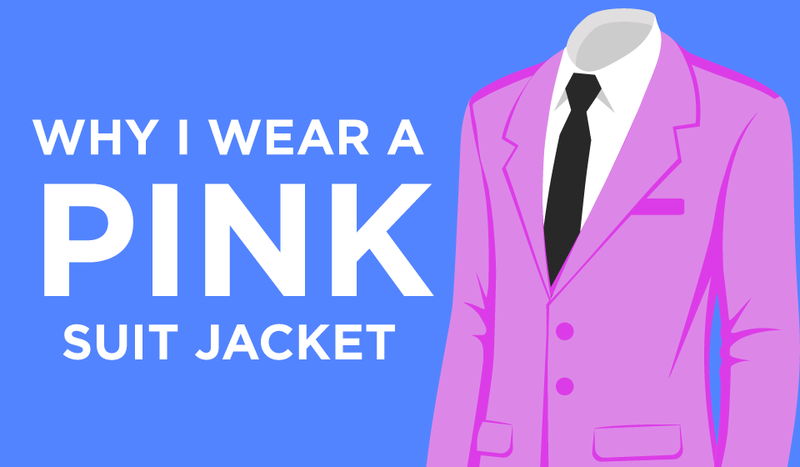 Do I think this could help me stand out?” If you answered no to any of them, keep searching until you find your own version of my pink jacket.